This is a very late "January 2018" portfolio summary post. I was traveling in first half of February so it was hard for me to find a time to reflect on what happened in my portfolio. I decided to do the summary now, after the market close on February 23, 2018. It will reflect all events up to this time. I wanted to start off and comment about the general direction of the market in the last 2 months. The plot below shows the S&P500 index in the last 12 months. The S&P500, for new investors, represents the US's largest 500 companies and the performance of those 500 companies together can be tracked in this index. The index can be purchased with index funds such as SPX with usually very low expense ratios (ER = fees per year). For investors that don't want to spend time researching and picking individual stocks I recommend purchasing a low cost index over time and holding it. The S&P500 has experienced its first correction in many months. There was a 10% drop from the end of January until the bottom in early February. I felt the market was getting too extended in January and this pull back is a nice welcome to bring valuations back down to more reasonable levels. When stock prices start to become parabolic, there is usually a correction. One can witness the parabolic movement from November until the peak in January. I experienced around a $40,000 paper value decline in portfolio during this time. From January to February I continued to add small amounts to my portfolio to collect additional shares in high quality companies that have withdrew 10-20% in value. I did not make any large allocation changes in my portfolio. Nearly all the positions (note SO was exchanged in my portfolio for AT&T) continue to sit in my portfolio and dividends are collected. The purpose of this portfolio is income accumulation, not timing of the market or observation of how the dollar value of the portfolio compares with the index. The dollar value of my portfolio is only secondary, as those assets are only there to produce dividend income. The growth of the income is of high priority. Usually growth of dividends is followed by growth of share prices. Any increase in my portfolio's dollar value is icing on the cake; the priority is dividend growth which I track very closely on separate graphs. The safety of the dividend is of utmost importance and I see no fundamental differences among the companies I hold between the January peak and the bottom in February. I still remain positive in the long term prospect of America. 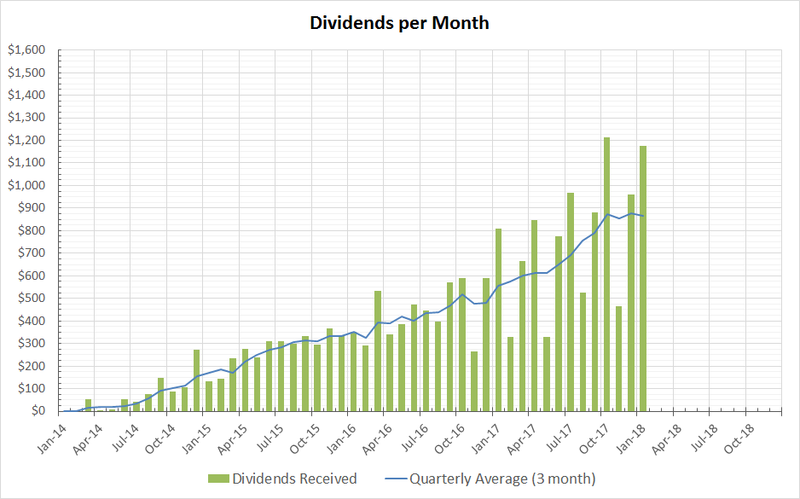 In January 2018, last month, I received $1175 in dividends. Not a bad amount. I used some of this amount to help fund my trip to Tokyo in February. Although markets were very volatile in February as they usually are, the dividends were highly predictable. They just continue to come in and I do not see any payout ratio problems with these companies so far. Dividends continue to be a smooth climb upward. The plot below shows what I received so far in previous months. Market is cheaper. There are some good deals around, wish I had more cash. Each dollar invested now pushes my annual dividend up much higher than before's purchases. The last two weeks have been a godsend for me. I am seeing 10% discounts across the board for some high quality companies that have absolutely no change in fundamentals. I have no idea why the market is reacting the way it is. Some say it's because of rising interest rates. Others say it's due to margin calls due to over leverage on the volatility derivatives. To me, the companies I own have still the same fundamentals a month ago as they do now, and I do not see any danger in any of the companies I own in regards to their dividend payout ratios. All that has changed for me is the lower purchase price which makes buying a lot easier as yield % have gone up on every single company. This makes every single dollar that I put to work now much more effective than the dollars I deployed a month ago. Everyone is panicking but I do not understand the mindset. I am finding the opportunities given in this period to be positive especially given the tail winds many of these companies are experiencing (i.e. lower tax rates and repatriation and expanding markets and weaker dollar). My strategy this time is to load up on the highest quality dividend paying companies in sectors that I am too underweight in. Since I have around 1/3 my portfolio in consumer staples, I want to pay less attention to that sector. I will focus on industrials (6% weight) and healthcare (14% weight) first. Since these more cyclical sectors tend to have a higher beta, they should have larger pull back percentages than pullbacks seen in the consumer staples space. Materials (1% weight) and Tech (2% weight) are sectors I will also be looking at but those are sectors I do not have such a high priority in. I only have so much money to go around when buying. For financials (9%) I will be only looking at Visa and Mastercard which to me are very expensive and I already have quite a lot of both (their yields % are quite low for me), so those two are lower priority. For REITs, I do not plan to add more in the short term. I will only reinvest the high % dividends. REITs do not do so well in rising interest rates and I have enough position in "O" to make me happy. I do want more utilities, it's one of my favorites sectors. However I think there is more room to fall given the headwinds and negative narrative of rising interest rates. The companies in that sector are just way too overvalued given the rising rate environment. There's better names elsewhere to get with a higher growth rate for the same P/E ratios than sticking to the overvalued companies in the utilities sector. The only exception I would say is NEE which I always am looking forward to add. I prefer to prioritize purchasing companies that I feel have a higher propensity to "spring" back up due to a positive growth environment (industrials and defense companies for example) instead of companies that will have a negative narrative (rising interest rates) looking forward for a long time. All three are industrials that pulled back recently.